YANGON—In an effort to counteract the significant decline in foreign direct investment (FDI) over the last two fiscal years, the government’s Myanmar Investment Commission (MIC) has launched a major investment promotion plan which aims to attract more than $200 billion through responsible and quality business over the next 20 years. 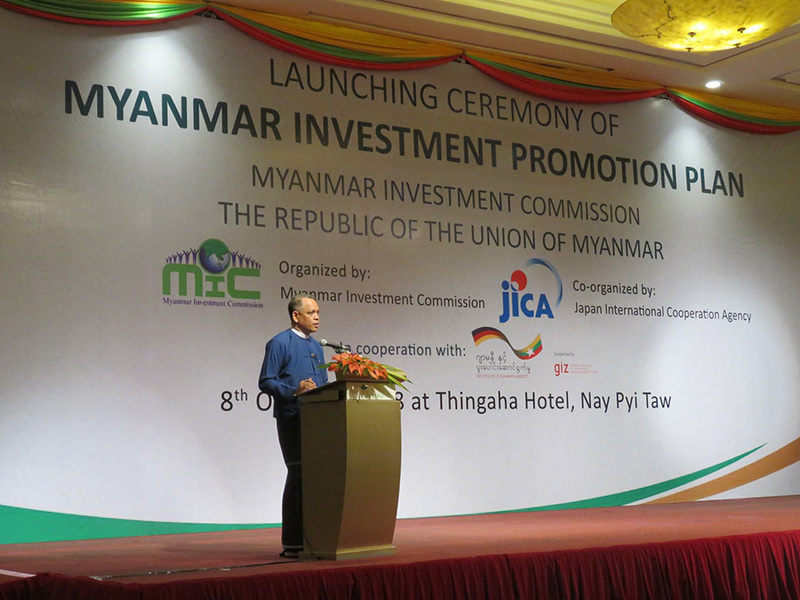 The Myanmar Investment Promotion Plan 2018 (MIPP) announced on Monday, outlines three strategic periods in the plan to attract FDI. It projects to receive $8.5 billion the first four-year phase starting from the 2021-22 fiscal year, $12.3 billion in the four-year phase of 2026-2027 to 2030-2031 and $17.6 billion in the third phase from the 2031-2032 to 2035-2036 fiscal years. The Myanmar government believes FDI is a key driver of economic development and is committed to an open, fair and clear investment policy, according to the MIPP. Daw Aung San Suu Kyi’s government is struggling through a chronic economic slowdown. A recently conducted short-term business sentiment survey showed that this year has been the worst across all business sectors and that business confidence had declined compared with last year, with a majority of businesspeople complaining of a lack of clear economic policies from the government. FDI in Myanmar significantly declined from $9.5 billion in the 2015-2016 fiscal year to $6.6 billion in 2016-2017, after western investors became cautious and the country’s image became badly tarnished by the Rohingya crisis in Rakhine State. The MIPP was jointly formulated by the MIC and the Japan International Cooperation Agency (JICA) with an aim to implement the MIPP objectives by adopting strategies and setting up a task force, he said. The government promises to impose policies that support macroeconomic stability, encouraging and reliable laws and regulations and reliable financial systems in order to build an effective economic infrastructure. The government said they will establish simplified, fast and clear investment processes through the MIC and other related governmental organizations. They will also take responsibility for improving the investment environment, enhancing fair treatment of local and foreign investors and ensuring investor protection, according to the MIPP. The Myanmar government said they will ensure that both local and foreign investors follow the rules and regulations which outline their responsibilities to society, the environment and natural resources. The MIC said the slow-down in investments has been caused by ongoing concerns about political instability, weak macroeconomics, residual investment restrictions and uncertain investment approval procedures. They said there is a lack of investment promotion and that the infrastructure, financial sector and business regulatory systems are underdeveloped while the country also lacks skilled human resources. According to the new investment promotion plan, the government aims for Myanmar to become a middle-income country by 2030 and will make economic reforms to ensure fair and transparent investment systems and institutional development for investment promotion. They intend to oversee infrastructure development, supportive business-associated systems, competitive industrial links and a higher quality of human resources. The government projects the GDP to reach 152,174 trillion kyats during the 2021-2026 phase—up from 105,998 trillion kyats in the 2016-2021 phase. It is also expected to increase from 218,466 trillion kyats in 2026-2031 to 313,636 trillion kyats in 2031-2036. The MIPP aims for improvements in the business environment that will increase Myanmar’s rank in the World Bank’s ease of doing business index to be within the top 100 by 2020 and the top 40 by 2035. Myanmar’s 2018 ranking is at 171 while Laos ranks 141, Cambodia at 135 and Philippines at 113 among the ASEAN countries. The government envisions four paths of investment growth for long-term improvements—investment in export-oriented industries, domestic market-oriented industries, resource-based industries and knowledge industries. According to the MIPP, the government intends to make the most of Myanmar’s abundant labor, natural resources and cost increases in advanced Asian countries as a way of attracting more investments in export-oriented industries. There will be a focus on increasing investments in the domestic-oriented market by increasing its size and improving underdeveloped local industries (including infrastructure). The government will promote the agriculture, mineral, forestry and fishery sectors in order to bring about growth in resource-based industries. Moreover, it is also expected to promote service industries in order to be able to provide new services based on a particular expertise such as information and communication technologies, according to the MIPP. According to DICA, the government will form five working committees for the implementation of the Promotion Plan.